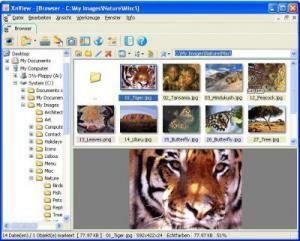 Portable XnView is a small and easy to use image viewer that lets you easily browse your photos and convert them to widely used formats. Since this is the portable version of XnView, it runs with no installation required and all of its assets are contained in one folder. This means you can easily run it from an external storage device, and should you open it from your local hard drive, no Registry changes will be performed. Portable XnView lets you work with JPG, PNG, BMP, TIFF and GIF image formats. The simple interface displays photos as thumbnails but this is just the default setting and you can change it to other views like thumbnails and details or thumbnails and labels, among others. The tool can also work in full screen mode and allows you to lock zoom or map the image, set an automatic image size and convert to colors or grayscale. Photos can habe their highlights, brightness, shadows, and contrast levels adjusted, plus you can fix red eye, extract a channel, apply watermarks and text, set DPI and other useful actions. What’s more, the program includes various effects like soften, emboss, drop shadow….etc. as well as user filters and plugins support.